Welcome to Radisson Red, Portland, the perfect place to discover a whole new hotel philosophy: it’s time to replace the traditional hotel model and its rigid rules with technology, art, design, fashion, and music. Radisson Red, Portland brings on a true revolution and a completely innovative mindset. 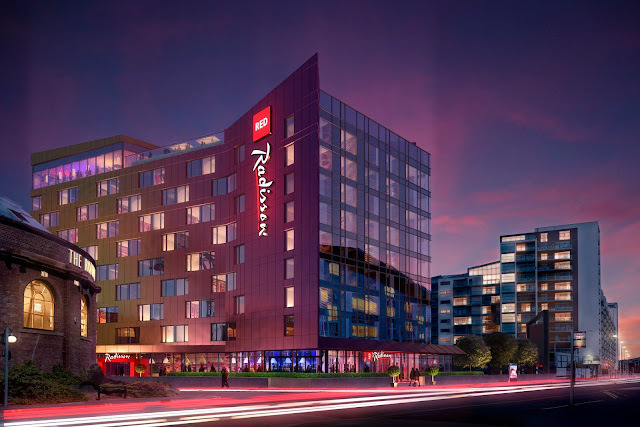 First off, some basics: the new Radisson Red occupies the first nine floors of the Broadway Tower at 1455 SW Broadway, near Portland State University. In this 180-room hotel, many things will surprise you starting from: keyless entry, free high-speed Wi-Fi, a Starbucks just off the lobby, a RED fitness center open 24/7, and a Radisson Red app to order at the on-site restaurant. It's your place, you're in control. You can connect your devices, work, have fun, and meet new people: in other words, you can have a great time. Plus, if you book a room now, you can save up to 35%: take it into account. The communal spaces often change their shape and look to host fashion shows or exhibitions from local artists, while streaming customized Spotify playlists. It's the perfect place for business travelers and tech-savvy people who are looking for cool and hip vibes. Even the architecture itself is designed to make you feel like you're walking through an art gallery, what more could you ask? One of the amenities of the new Radisson Red is the “OUIBar + KTCHN”: a food, drink and social hub on the ground floor with an extensive list of cocktails. The menu offers international street fare from exotic corners of the world as well as local Oregon-brewed beers and wines. You can even use the Radisson Red app to order your meal and it will be taken straight to your room. In the morning (or whenever you need a break) you can hit up the Starbucks just off the hotel lobby to taste one of its classics. Then, after a long day of exploring, just unwind and enjoy the informal, relaxed social scene. Radisson Red guests can gather in the Events & Games Studios featuring four meeting rooms total 4100 square feet. What you do in these spaces is completely up to you. Just keep in mind that if you enter here, you say goodbye to bland and dull. Are you planning to throw a party? Are you about to schedule a corporate meeting? Well, the Studios are designed to be multifunctional, unique, fully-equipped (even with ping-pong tables and catering) to make sure that the following rule always applies: work hard, play hard. Now, after a very relaxing break at the Radisson Red, it’s time to explore the surrounding area. Located in the very heart of the Arts and Education district, so many attractions are within walking distance: restaurants, local shops, and obviously Portland State University. So here are two must-visit places, perfect to start your day in Portland. Put on some comfy shoes and go explore! Covering a space of an entire city block, Powell's City of Books is the largest independent bookstore in the world. You can shop new, used rare and out-of-print books: a surprising catalog of over a million items. Located in the Pearl District, the bookstore has nine color-coded rooms and 3,500 different sections. This huge bookstore is open 365 days a year and it has its own coffee shop. Getting lost through those piles of books is extremely easy: so, if you want to navigate consciously, get yourself a detailed map (which is available in the store). Those who work there are perfectly able to tell the regulars from the others, they're happy to help everyone, talk literature and explain why people always “keep it weird” in Portland. Joggers, skaters, cyclists, and strollers: listen in! Tom McCall Waterfront Park is your go-to place. This riverside park is home to annual events (like the Portland Rose Festival and the Oregon Brewers Festival)along with local, quirky Saturday markets: hundreds of people go there, so be ready to find it packed. In addition to festivals and concerts, the park's design includes amenities such as 100 cherry blossom trees and the Japanese American Historical Plaza.